Synopsis: Darren, the vampire's assistant, gets a taste of the city when he leaves the Cirque Du Freak with Evra, the snake boy, and Mr. Crepsley. When corpses are discovered - corpses drained of blood - Darren and Evra are compelled to hunt down whatever foul creature is committing such horrendous acts. Meanwhile, beneath the streets, evil stalks Darren and Evra, and all clues point to Mr. Crepsley. Can they escape or are they doomed to perish in the tunnels of blood? Review: This is the third book in the Cirque Du Freak series. I bought all twelve of the books in the Cirque Du Freak series at a local second hand shop. These books cost 99p and come on a buy one get one free offer. This was an extremely enjoyable read and I found that I could not put this book down. In my opinion this book was more interesting than the second book but that's most likely because more happened in this book. 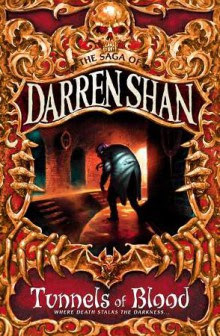 I have plans to repurchase these brand new and will be donating the used copies back to a second hand shop so that someone else can experience the brilliance of Darren Shan. I would highly recommend this book series to anyone with an interest in young adult and paranormal stories.